ttsandra | navigating beauty & personal style - Find of the week! 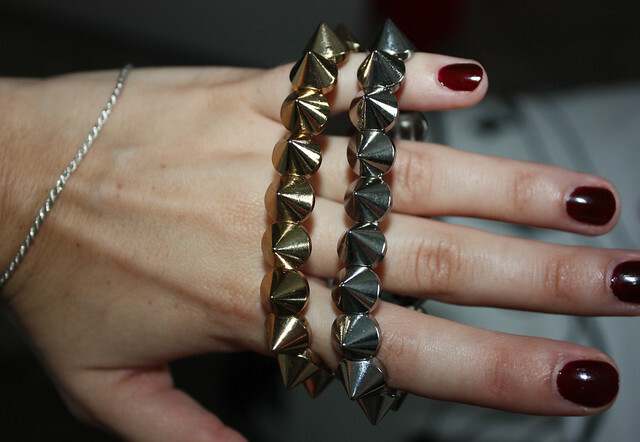 You probably remember my desire for all things studded/spiky when it comes to bracelets (it was in this post), I have finally found a fix - that doesn't break the bank. I found these spiked cute things at Forever21, a place that I have tried to avoid over the past couple of years because A) it's always crowded and B) after about 10 unsuccessful visits I just gave up. I was pleasantly surprised by these. The metal finishes and tones are nice, they feel nice in my hand (not too light or plasticky -- is that even a word?) and the best part... they cost $5.60 each! They will look lovely paired with more high end bracelets and perhaps a watch! I need to get myself a proper tripod for my DSLR camera so I can start posting outfit posts again.